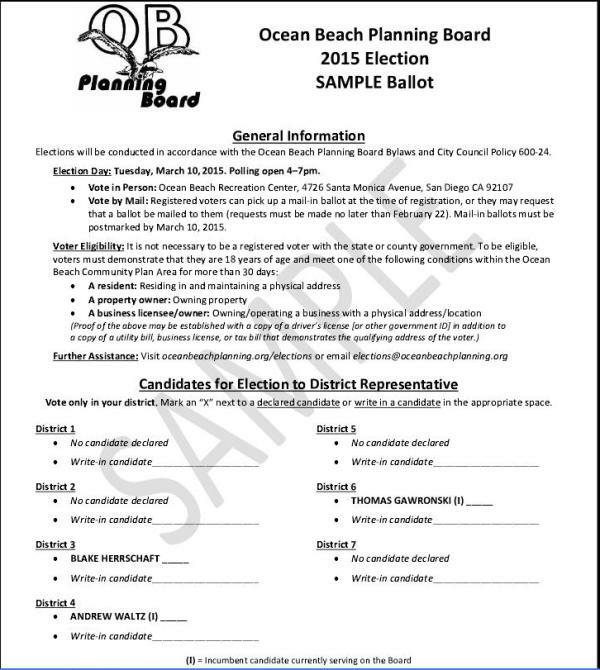 Here is the sample ballot for the upcoming 2015 Ocean Beach Planning Board annual election. It will be held on Tuesday, March 10th at the OB Recreation Center. Polls will be open 4-7 p.m. The Ocean Beach Recreation Center is at 4726 Santa Monica Avenue. Interested candidates are still welcome to run on a write-in basis provided they meet all eligibility requirements. See oceanbeachplanning.org/elections for full details. Mail-in ballots are available upon request for voters who register in advance.